One week after panic broke loose, many Amazon vendors are breathing a sigh of relief. Amazon has dialed back its decision to end a majority of weekly purchase orders, offering temporary relief to those affected. Amazon would resume its orders following a 'temporary pause,' read one email to a vendor. But the dust has yet to settle. 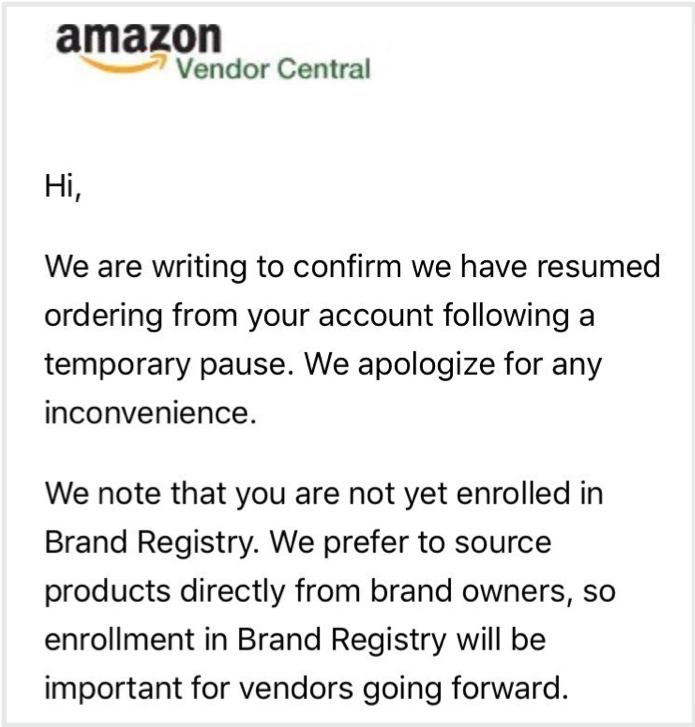 Within the same email, Amazon urges the vendor to sign up for Amazon's Brand Registry enrollment, a program that lets brand owners and licensees submit proof that they are an authorized seller of goods. The vendor has 60 days to enroll. Afterwards, non-brand owners will be sent over to Seller Central. Only registered vendors will retain access to automatic purchase-order fulfillment from Amazon, according to Digiday. So, was last week a fluke? Likely not. "Amazon was [probably] dipping its toe into merging Vendor Central and Seller Central into One Vendor, but it 'kind of bungled the execution,'"CEO of Amazon-focused agency Indigitous Larry Pluimer told Adweek. Amazon remains tight-lipped about the situation, still denying the existence of One Vendor while former employees argue otherwise. But all the signs seem to indicate that a consolidated platform would be in Amazon's best interest. Protecting the customer's experience: Over the last several months, Amazon has been telling sellers on both sides of the divide that they 'obsess' over customer experience. Mid-sized and large brands were just recently pushed in the other direction (from Seller Central to Vendor Central) under this explanation. There's a silver lining for vendors who are bumped over to Seller Central in the days leading up to One Vendor. Marketplace merchants enjoy greater control over the price of their goods, can run price promotions and receive more data around their performance, among other perks. The trickiest part may be getting up and running, or getting the training and expertise to efficiently manage your end-to-end operations. This is why sellers choose Zentail. The right ecommerce automation software can give you a leg up when launching to a new platform—be it Amazon Marketplace, eBay or their other counterparts—by centralizing your operations and letting you automate manual, duplicative tasks. It will also provide easy integrations into your shopping cart, 3PL and other technology to streamline everything from listing, order fulfillment, inventory and warehouse management. ...is a diversified channel mix. After all, what's happening now is reminiscent of what happened just a year ago. Remember Amazon Vendor Express? Just three years after its launch, Vendor Express was officially canceled and set to shutter in January 2019. The wholesale program gave small private-label brands a quick way to become a direct Amazon supplier, but eventually left them stuck between the more involved Vendor Central or self-service Seller Central. Today, some sellers are (understandably) jaded. "...the drastic actions are the latest example of how the fortunes of brands and merchants on Amazon’s platforms can change on a whim." -Recode. Learn more about building a healthy, multichannel portfolio or contact [email protected] with any questions or concerns.